Parkinson’s disease is a movement disorder that worsens over time. It causes the eventual malfunction and death of neurons in the brain. Here’s what happens. The substantia nigra is the part of the brain that houses the affected neurons. These neurons create less and less dopamine over time. Dopamine sends signals to the portion of the brain that controls movement and coordination – over time, patients with Parkinson’s can no longer manage their body’s movement. While doctors are still unsure of what causes Parkinson’s Disease, they do know that older loved ones are at greater risk for developing the condition. Other factors play a part in its cause like genetics, environmental toxins and illness, but can vary from person to person. Some scientists think that when a person loses cells in other parts of their body and brain, contracting other diseases like Alzheimer’s, it makes them susceptible to Parkinson’s. Today, research on this phenomenon remains inconclusive. While there is currently no cure for the condition, there are ways family members who are affected by Parkinson’s can help manage their symptoms. Because the disease influences a person’s ability to move, research shows that exercise is a good way help strengthen muscles, sharpen flexibility and mobility, improve balance and lessen joint stiffening. Research shows that over a two-year period, seniors with the disease who exercised regularly experienced a slower rate of decline in HRQL and mobility. Physical activity proved to be especially helpful to those in the advanced stages of Parkinson’s Disease. Even if your senior is receiving personalized elder care or outpatient services, aerobic fitness can also improve their overall health. If you or your loved one is suffering from Parkinson’s, get the ok from your doctor before beginning an exercise regimen. 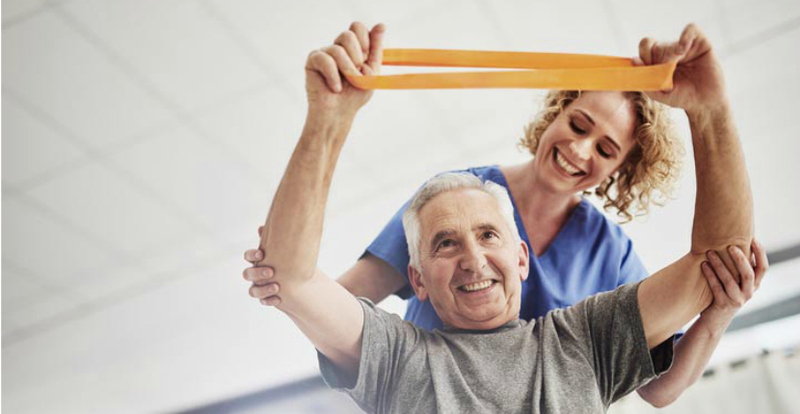 Based on your health condition and the level of intensity advised for your workout, consider the following ideas from Freedom Home Care to help you get the most of your routine. Start each workout with a short warm-up and end by cooling down. Be sure to include stretching exercises, aerobic activity and resistance training. Exercise the jaw, voice and facial muscles. Include aerobic exercises like swimming, which call for less balance and put less pressure on the joints. Hold on to bars, rails or anything that will help you stay balanced. Stop exercising when it hurts. Find what feels right for your health situation and stay with it.